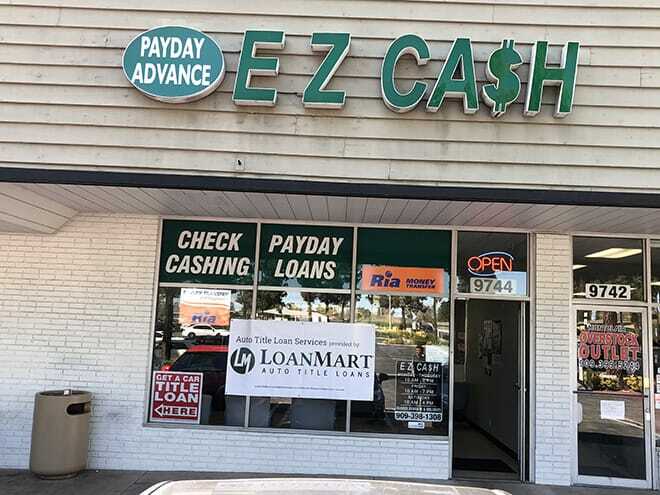 This walk-in EZ Cash is in the Montclair Town Center on Central Ave.
OmniTrans bus line #85 has a stop at San Bernardino @ Central Wb Fs, right next to this EZ Cash location. Check their website for more information. Within the vicinity this location are T Shirt Warehouse, Burger King, Yum Yum Donuts, Tepeque’s Mexican Food, and 7-Eleven. Competitive Auto Title Loans in Montclair! Living with poor credit is challenging. If you need funds quickly but you have poor credit, come to LoanMart—they may be able to help you receive up to $30,0001 in financial support in as little as one business day3 with an auto title loan in Montclair. An auto title loan is a kind of loan that allows the borrower to receive funds using the title to their vehicle as collateral. LoanMart customers may continue driving their vehicles just like before with no restrictions as long as they make monthly payments on time. Find out how to apply and about all of LoanMart’s benefits below. Apply for a LoanMart Auto Title Loan in Montclair Today! Why should you apply for auto title loans in Montclair? It’s free to apply and there’s no obligation to continue with the auto title loan if you qualify. Everyone has the right to make an educated decision about their financial future. Check out all the LoanMart benefits below. Opportunity to refinance an existing auto title loan from another lender with LoanMart if you meet our requirements. Keep reading below to see how to apply! LoanMart is open, so you won’t have to miss work to get started on an auto title loan in Montclair. Choose a contact option below and start reclaiming control of your financial life! Click Chat Now to chat with a LoanMart Agent immediately. Once approved, your agent will talk to you about your title loan and how to receive your funding, via LoanMart and EZ Cash! Act now! Apply today to get the funding you need from a title loan with 800LoanMart and EZ Cash!